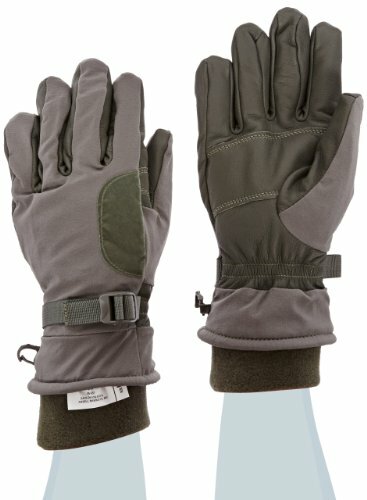 They may be worn alone or over lightweight glove inserts. 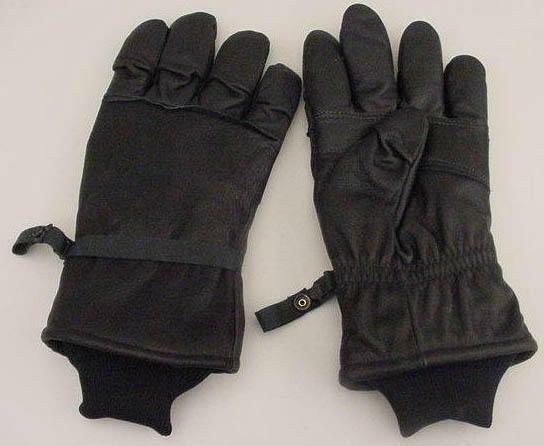 These gloves are not intended for heavy work such as rappelling or barbed wire handling, for hot work such as welding or changing machine gun barrels, or for use by POL handlers. The glove shells are slipon, inseamed, Flexor design with a wing thumb, having a leather shell, waterproof/moisture vapor permeable insert, microfiber insulation and polyester lining, buckle/strap adjustment on the back, and a snap hook/dee at the wrist. Several subtle changes to the glove's original mid-1980s design have been borrowed from the commercial glove industry. The color is foliage green instead of black to coordinate with the colors in the ACU. The palm and fingers are covered in goat skin, rather than cow hide, for better durability. The fingers are slightly curved, making the glove more ergonomically correct. The back of the hand features a four-way stretch nylon instead of leather for dexterity. A soft nose-wipe feature on the back of the thumbs. Reduced-bulk insulation on the trigger finger so its users can have more dexterity when firing weapons.